My wife and I are going on holiday to a resort. While the resort markets the room as having a double bed, in reality it is two twin size beds pushed together with a narrow gap down the middle where they meet. We have stayed with this company before and the floor is tile, so as the night progresses, the narrow gap tends to widen. Apart from us staying on our own sides of the bed, is there anything we can do to make it more comfortable? Ideally, we would use the sheets and towels in the room, but we would be willing to buy and bring something if it will make the situation much better. There is a funny-looking gadget on sale in several places that can be used to fill the gap between the two joined beds. This makes things a bit more comfortable at the beginning of the process, but it works only until the gap becomes too large. Moreover, it doesn't look exactly travel-size. You simply have to increase the friction between the bed legs and the floor. The easiest way is putting something sticky or rubbery below the legs. Be creative; you can use for instance silicone pot stands, or even duct tape (is there anything it can't fix?). You can use a belt to hold beds together. Wrap it around the side frame. Or if you have a couple, just join two pair of legs. One thing that worked for me before is wire ties. 2 or 3 of these can easily hold the two beds together so that they don't slide apart. Then you fill the narrow gap with a folded sheet or blanket and put regular sheets over it. Depending on the type of bed, you may need different length wire ties. Simple metal frame is the easiest. Wider wooden frames require some longer ones. Regardless, wire ties are very cheap and when you're about to leave, simply cut them off with scissors or a pen knife. We turn the beds sideways. So both our heads are on one bed and our feet are on the other bed. You will find it best when sleeping or cuddling to put your bottoms on the same bed as your feet, keeping your legs slightly bent which works best while spooning. There are two basic approaches to combining twin beds: by clamping or attaching the bed frames together, with something like a C-clamp or tie, or by connecting the actual mattresses together with a large strap or belt that wraps around the outside of the mattresses. Using clamps or wires to connect the two frames together can be done in a quick-and-dirty way using inexpensive items like C-clamps, zip ties, etc. but different kinds of frames may require different approaches. A C-clamp may work on a steel bed frame, but not a pedestal type frame. If you're looking for a universal solution that you can take with you when you travel to different locations, I'd suggest using the strap approach. It will work with any kind of bed frame, or even with mattresses right on the floor, and will also ensure the mattresses don't separate in the middle, creating an uncomfortable gap. 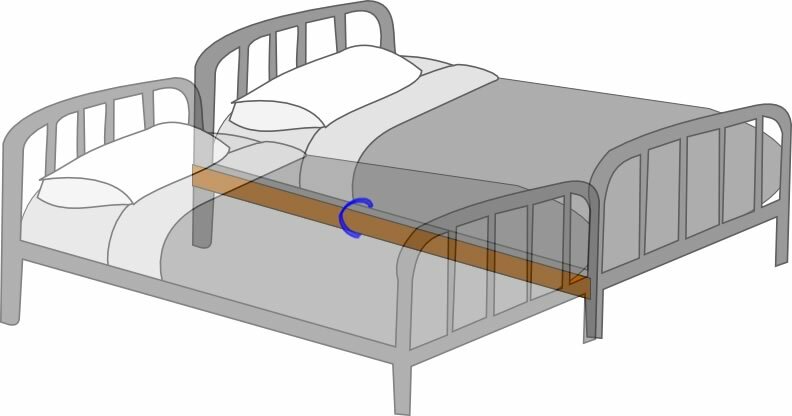 put a fold paper below the extreme legs of the bed, to increase the height of extremes relative to inside legs, such that if they ever had to slide, they will towards each other, but not apart. I've slept fine on beds where the hotel has used two singles. On these occasions I've noted the beds were actually put together so one was at the head and the other at the foot of the bed. Bring with you a roll of duct tape (Gorilla brand tape would be ideal) and a king size bottom and top sheet. Pull off the bottom sheets from the mattresses, run duct tape around the circumference of the mattresses a couple of wraps, and re sheet with the king sheets using the other sheets underneath to pad the seam. would be less work than it sounds, effective, and easily undoable when you check out. Not the answer you're looking for? Browse other questions tagged tips-and-tricks sleeping beds or ask your own question.